In this six week course, we will explore the causes of suffering and dissatisfaction through the practice of insight meditation. By bringing our unchallenged beliefs and patterns into the light of awareness, we can see how our rigid ideas often blind us to the richness of our true nature. The wisdom that arises through insight meditation allows us to see our inner experience clearly. This leads to a sense of freedom, well-being, and confidence that is rooted in awareness itself and available to us each and every moment. 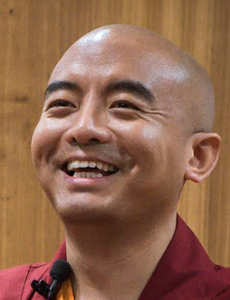 Each lesson includes experiential teachings by Mingyur Rinpoche, as well as guided meditations and moderated discussions with Tergar Instructor Myoshin Kelley and Facilitator Scott Anderson. The first three videos will be available as soon as you register. This course is open to meditators who have previously attended Joy of Living 1 and 2 meditation workshops and meet the practice requirements, as well as to those who have not attended these workshops, but who have practiced meditation regularly for at least three years. NOTE: You must register for Tergar Learning, activate your account by clicking a link in your email and log-in before you can register for this course.